What Happened to Klimt’s Golden Lady? Helen Mirren and Ryan Reynolds tell the story Hollywood-style in “Woman in Gold,” but if you want to know what it really took to get Klimt’s masterpiece back to its rightful owner, watch this! The real Randol Schoenberg gives a riveting account of his work on behalf of Maria Altmann that makes their eventual triumph in Austrian courts all the more satisfying. 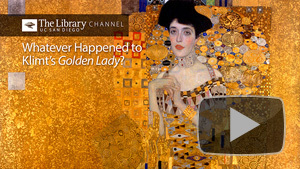 Watch What Happened to Klimt’s Golden Lady? with E. Randol Schoenberg on The Library Channel.